Posted in About the Pole-Shift, After-Time, Channeling. We all have our paths to trod through the run-down to the Pole-Shift and into the After-Time, but are we sleep-walking, or are we walking-in-awareness? Many aspects of our lives can be altered and changed for the better, such as our attitudes, our personal habits and the people we associate with and this is good, but our safe locations? Not so easy. Safe locations for the Pole-Shift are both cultural and individual in nature, the choice of which results in massive consequences to our physical lives. We have to choose our safe locations carefully so that all our needs will be fully-facilitated for our individual and families benefit. Listen to the following for your best outcomes. We are watched closely by our spiritual guides, those who love us, our spiritual family, but they can only do so much for us, we must do the rest: “the rest” is our situational-present we are responsible for. From my perspective, outcomes can be adjusted spiritually by our over-seers in ways that are impossible to understand, let alone explain, so this is where faith or confidence in our lives factors-in, we have to trust that all is well for us and our loved-one. If we flail-about with emotionally-based decisions, we suffer the consequences of our actions. If we are patient and calm, we can watch our lives from a dispassionate viewpoint and act in a timely-manner with reasonable responses producing better timing and therefore better results. The Pole-Shift presents many challenges to the public on the ground, but these are all surmountable if we calmly approach preparation and the ultimate event with courage. Some of us are in charge and care of those less capable, this is a blessed burden, so we will be assisted on high by those of us who watch over you. When the Pole-Shift approaches, all those in care of others will be lifted-up in various ways so that the care we administer can be fulfilled in the highest ways possible according to Soul who watches over it’s off-spring. 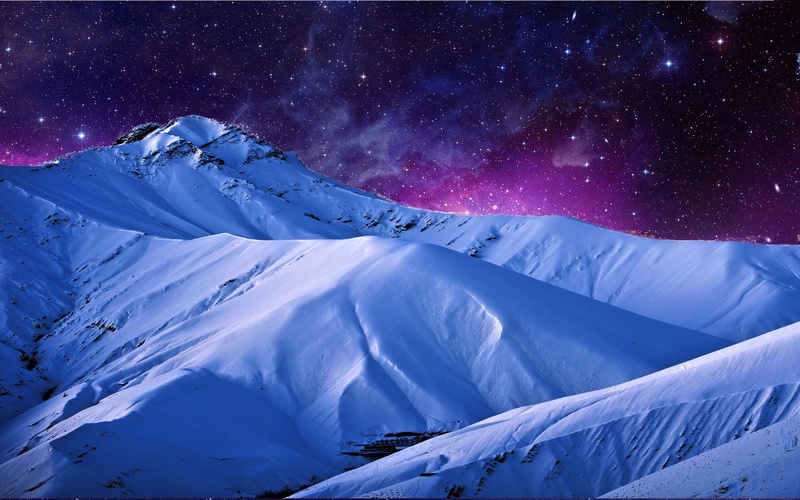 As the Pole-Shift unfolds, many people will die, this is a natural occurrence which has been planned-for well in advance, so there is no need to worry for surviving family or friends: All is good. All survivors of the Pole-Shift, who are listening to soul, will be assisted in ways that are both mystical and physical. Assistance is close-at-hand and will address the needs of the individual and those in their community. After the Pole-Shift, there will be much whailing and gnashing of teeth, so much so, that those listening are likely to be overwhelmed: do not worry or fret about this, for assistance of an invisible nature will be proffered. Let those on the ground know and understand that their duty is blessed on high and will be rewarded in ways not understood or expected. Those who survive will be provided with ways and means that will both benefit themselves and the community at large for they are loved by those who in concert assist the general population of Earth. When all is finished, when the Earth returns to her normalcy, then those who have endured will see great blessings and things to behold which will provide much hope and forward thinking. Earth is indeed destined to be a new place for advanced souls to express their new-found soul abilities and much love will emanate from her. So, for those doubtful of Earth’s future: fear not, for she is destined to be a new planet of hope for the spiritual growth of Soul in the lower Universes. Blessed be. So it is when the Pole-Shift is concluded, and it most certainly will, those who have prepared and survived will be assisted greatly. Many people will have been lifted-up during the Pole-Shift and those on the ground during the PS will have been assisted as well according to their soul directives. Soon after the dust has settled, many people will be assisted in the ways necessary to establish communities and all the required sustenance items such as viable water sources, food sources and the like. Soon after that, many things will be arriving that will help the survival communities, yes, this includes the famous “perpetual batteries” and such, so prepare for that. Once order is established, those on the ground will be also assisted with security, this is again in accordance to soul’s directives. Those people who ignore their higher calling will be, of course, led to their demise by their own hand. It is true, that all people surviving the PS will need to make provisions for safety, but, as I’ve said, they will be assisted. Earth will herself fall into normalcy, but there will be an adjustment period, this will entail a delay in returning to normal rotation and sea tides. Also, the skies will continue to display anomalies that the survivors may find unsettling, but this will be mitigated in necessary circumstances. Fear not, we are here to help, a million-strong armada of advanced space craft which are capable of many, many actions. So, once humanity has settled itself into an After-Time community value-system, it will see the insertion of the new zeta-human clones. These people are high souls, so please do not worry about them and their intentions. Yes, they will appear different but similar, but welcome them just the same. They will also be bearing gifts from on high, so please accept these gifts so that communications can begin in earnest and collaboration of the races can begin. Yes, they will have the technology available to them, but it is sequestered for their use not yours, yours being the surviving human race, but rest assured you will be benefited from this new race. Once Earth has re-established it’s cultural continuum, there will be visitors from other worlds coming to congratulate the Earth survivors and the new races of peoples of Earth who have assimilated with them. Beings of great value and stature will appear and also bring gifts to make life easier for all. Surely this will be worth waiting for. Blessed be. Safe Location video for Alberta and Saskatchewan. This video is the second of my Canadian series of safe locations for the Provinces of Canada against the Pole-Shift. Although Alberta is (somewhat) similar in it’s topology and geology to Saskatchewan, they have some contrasting situations for the After-Time, different enough to make it critical to watch both sections regardless of which Province you live in. The video opens with genuine sound-bites of Earth Groan, I explain Earth Groan in the video. During the recording of the second section on Saskatchewan, I noticed the Athabasca Tar Sands in Alberta near the border, so I commented on the possibility of the tar sands igniting during the Pole-Shift. It was while discussing the possible smoke trail from the burning sands area that I was shown the words: “FIRE” in orange lettering in my spiritual vision. I have edited my original PDF (Facebook LINK TO PDF) of the slide show to indicate the fire that will burn for years in the After-Time: the details are in the Saskatchewan section of the video. With a total of two areas as an exception (one indicated in the video), Alberta does very well for the Pole-Shift and the After-Time. 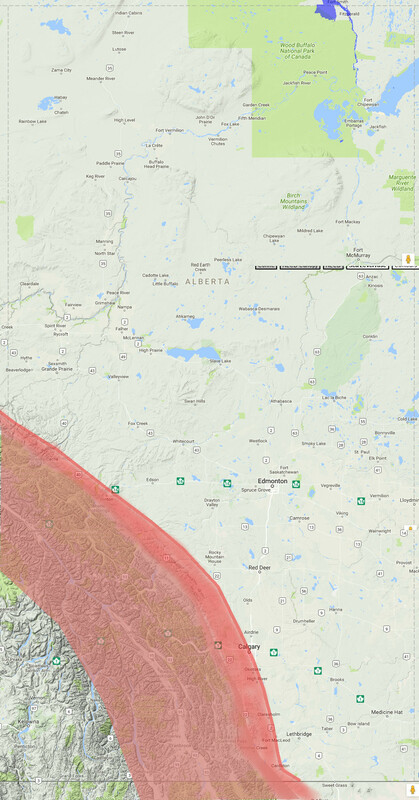 Of course the other area of concern (the tar sands) is indicated within my Saskatchewan commentary. As far as the best areas to relocation to for the Pole-Shift and the After-Time, that would be Northern Alberta, in fact, if one can set up their survival camp just over the border in the extreme southern North West Territories, all the better. The fact that the sea is coming to the extremely southern North West Territories is really sweetening-the-pot for Albertans to move this direction. Southern Alberta will become the foothills to the Rockies, although land-locked, could offer a good life too, in it’s own way. Saskatchewan is has several advantages over Alberta for the After-Time: lower population by 1/4 and the many lakes in the north on the Canadian Shield craton providing good water, although distillation is recommended for everyone in the After-Time for the first 2 decades against lead from the stratospheric volcanic ash fallout. The many lakes in northern Saskatchewan also will provide natural fire breaks against the highly-likely forest fires in the After-Time. Posted in After-Time, General, Videos. Safe Locations for Idaho, Montana, Wyoming, Nevada, Utah, Colorado, Arizona & New Mexico. This video is the next in my series that I am producing to offer my opinions (drawing on ZetaTalk) on where in the world it is safe from a Pole-Shift survival location perspective. 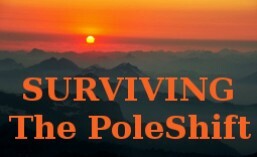 However, Pole-Shift survival is no survival at all without a lot of careful thought about your local After-Time conditions: I make that clear in my videos. Understanding the all-important reality of After-Time living in a social structure that would be similar to pioneering/homesteading in a “New Land” during the 1600’s. There are no references to such a shift in our modern society, so the individual must make this leap effectively to prepare properly for their After-Time environment. One of the major advantages we have now is foreknowledge of the Pole-Shift, that, and a far better technology to carry forward in our respective After-Times. Food is the new gold, thus, many areas in the world today will be wastelands for future generations to deal with. When you consider that all the great cities of the world from a trade & wealth (not Religious) perspective, you see one common thing about them: they are on the coastlines. 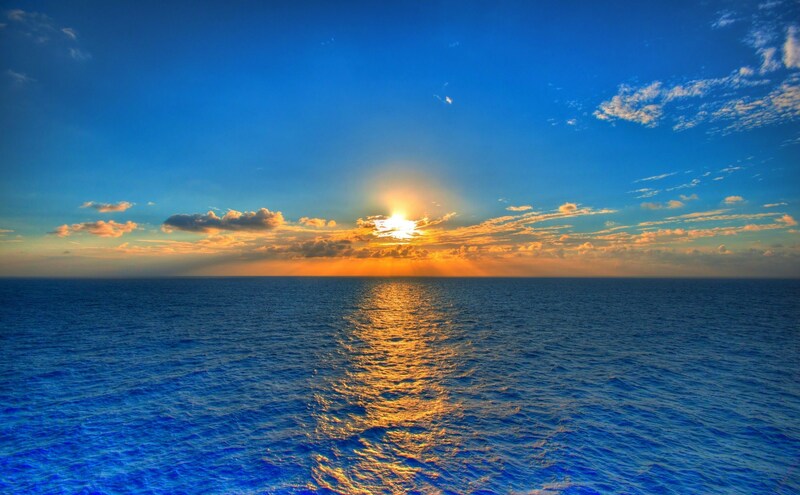 In the After-Time, the sea will be the greatest supplier of not only all the food we can eat but within 5 to 10 years great trade opportunities. One of my main themes, is to find a way to position oneself so that the rising seas from the Pole-Melt comes within hiking distance to your survival camp. The other way around will most-likely be the norm, people will be re-locating to the new coastlines after the Pole-Melt that ZetaTalk tells us will complete within 2 years of the After-Time. Putin’s land-grab of eastern Europe: His reasons why. 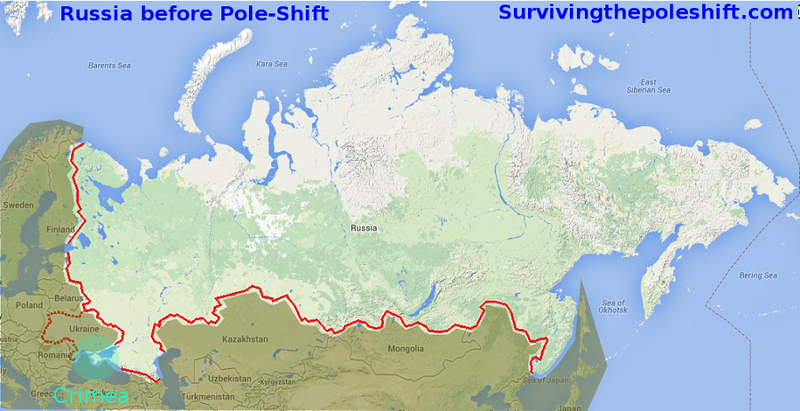 Russia before the Pole-shift: The Russian border is in red. I have obscured the boarder countries to emphasize the Russian-controlled portion of the Eurasian land mass. Notice that the Crimean Peninsula (circled by green) is included since Putin has reasserted control of this area as of spring 2014. The complexities of dramatic political moves by powerful leaders can usually be reduced to the greed for power, influence and money, even though the reasons claimed are often an attempt to sanctify such actions. But the shroud by which a strongman uses to cloak his true motives, now in the case of Putin and his ex-soviet state land-grab, on the surface seems to neither be necessary or desired. The obvious re-establishment of Russian rule over the Crimean peninsula as of March this year (2014) marks this new initiative by Putin in the former Soviet socialist republics. Before Putin was president of Russia and holding several Russian premierships, he was an officer in the KGB for 16 years, now it seems his experiences in this regard to appear to have smoothed his deft political hand in the re-invasion of the former soviet republics. The current “crisis” in Ukraine (September 2014), in my opinion, is obviously more of the same. Putin is leaning on the Ukraine leadership, his tacit support for the “pro-Russian separatists” and his stated desire to “protect Russian citizens” is most-likely an attempt to drag the entirety of Ukraine back into his power vortex. We know at this point it is only Donetsk and western Ukraine, yet I predict that Putin wants all the Ukraine. Even as late as mid-September 2014, Putin has threatened a take-over some of the NATO aligned countries in a private conversation revealed by President Petro Poroshenko of Ukraine. Think about what means: a veiled threat to take-over NATO countries. This is an indirect confrontation, by innuendo, with the western allies. To add to the intrigue, Putin is doing all this while the U.S. and the European Union have been applying sanctions against Russian oligarchs and Corporations: in other words, flying in the face of the raised eyebrows of the international community. So then, it clearly seems that Putin is brazenly effecting a takeover of portions eastern Europe, but what is his motive? Let’s take a look at this from an entirely different angle. 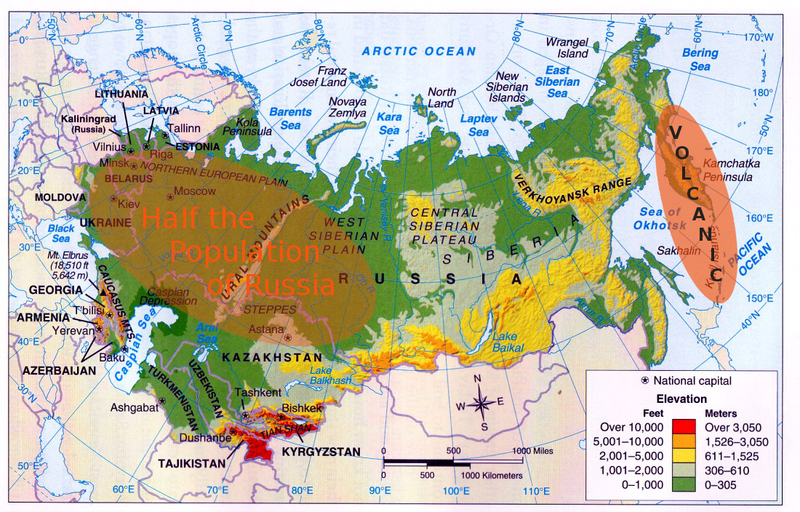 Half of Russia’s population lives in western Russia. First, let’s set the stage for the Pole-Shift with an understanding as to what it will bring. ZetaTalk tells us that as Planet X passes by within 15 million miles it takes hold of Earth’s magnetic core, re-orients it with the Earth’s mantle following behind, culminating in a 90° Earth-roll. This puts the current North and South pole geography on the Equator: that’s 6.4 million cubic miles of quickly melting compacted ice of Antarctica alone (Wikipedia on the Antarctica ice sheet: “That is, approximately 61 percent of all fresh water on the Earth is held in the Antarctic ice sheet, an amount equivalent to 70 m of water in the world’s oceans.“). After the Earth-roll (re-positioning mantel) comes to an abrupt stop, it causes a displacement of the world’s oceans forcing the full mass of the sea to pass over all the coastlines of the globe. This is why a safe location for the Pole-Shift must include a combination of a large distance and height from the nearest ocean. At this point, the Pole-Shift is finished and the After-Time begins. However, the After-Time starts with all the world’s ice positioned in Earth’s hot equatorial zone commencing a massive ice-melt. If anyone were to study the ZetaTalk website, follow the current ZetaTalk via the weekly newsletters, observe the corresponding political, social, geographical , oceanographic and atmospheric events unfolding, they would be hard-pressed not to be very impressed, not only with the quality of thought put into the converging concepts, but both verbal structure and meanings direct and implied. As an aside, ZetaTalk has been greatly maligned by very powerful forces, so much disinformation is found on the Internet. Yet it’s track record is second to none. Obviously ZetaTalk is attacked because of it’s accuracy, which also means that it is very much watched by the world leaders, in typical incognito fashion, of course. This is Russia 18 months after the Pole-Shift. The dark blue areas are below the 675 foot ocean rise: completely flooded. 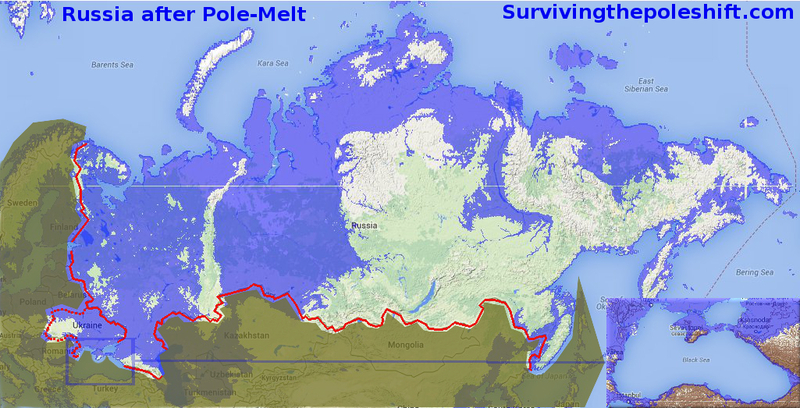 Notice that western Russia is completely under water except for the Ural mountains and a small piece of land where the Black sea was? The inset showing a close-up of the Black Sea is to illustrate the strategic position of the Crimean Mountains, which as is seen, will be the only large island in the new sea between western Ukraine and the Caucus mountains: a strategic location. Is it no wonder then why Putin is attempting to dominate the former eastern-block countries? With at least half the population of Russia seeking high ground in the west, Putin is clearly paving-the-way for his Russian people to have some where to go: the high land in western Ukraine, Crimea and perhaps that of southern Romania, Poland, Czechoslovakia and Slovakia, these countries all have high land and will be above the waves in the After-Time. We will see if he continues his conquering of eastern Europe. Credit: Zetatalk for revealing the essential motives of Putin contained in this blog post. Art is by Chris Thomas. The above image is approximately what North America will look like about 2 years after the Pole-Shift. 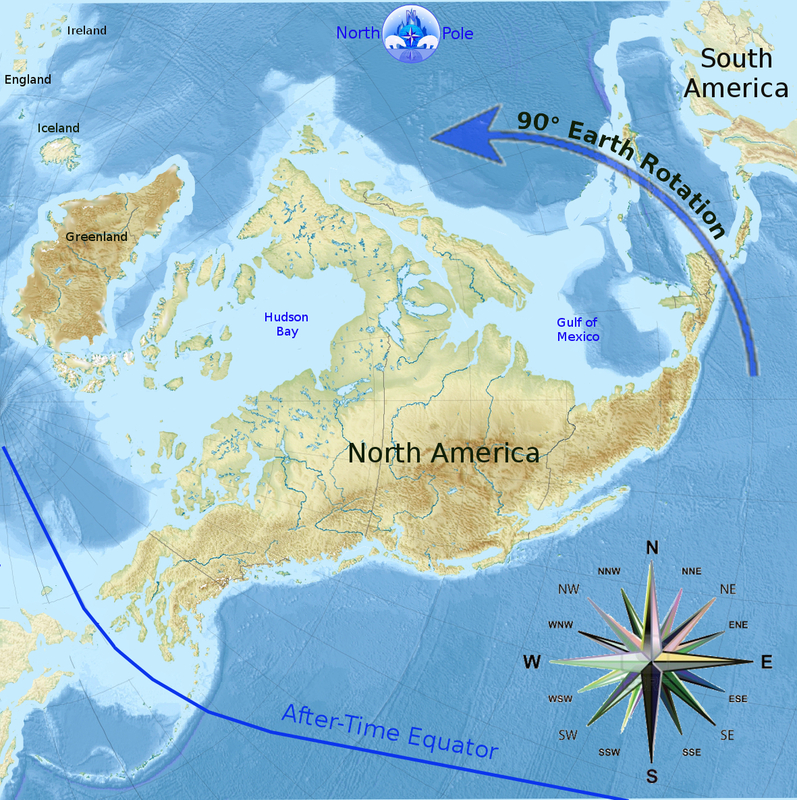 It is based on the sea level rise within 2 years of the Pole-shift (the “pole-melt”) and the approximate 90° geological re-location of Earth’s land masses (the Crustal shift) as described in ZetaTalk. The amount of above water land shrinks because all existing ice at the geographical poles will melt due to the fact that the poles “move” to a location near the equator. Art is by Chris Thomas. You know about Planet X. 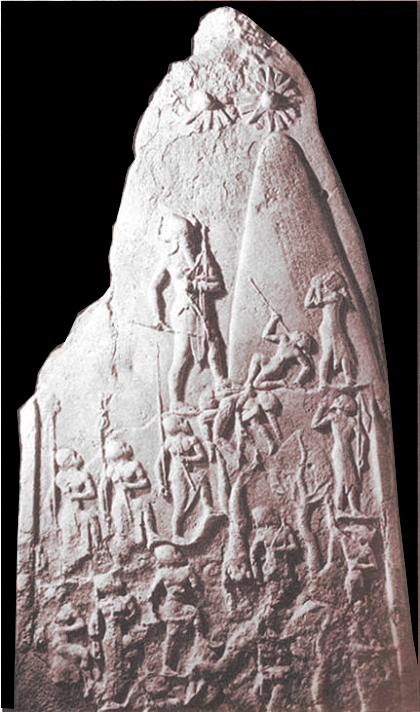 You have found the references to the Second Sun written by the ancients as allegorical accounts of Earth history, word-of-mouth stories by the modern original cultures and the stone carvings by their descendants depicting the same by natives of many different cultures. You have even found many old arcane scientific documents referencing a heretofore hidden gravitational influence in the direction of the constellation Orion. Also, with your study of all the pre-1985 newspaper and magazine public discussion of the goings on of NASA, you’re realization of the truth of the existence of Planet X deepened. 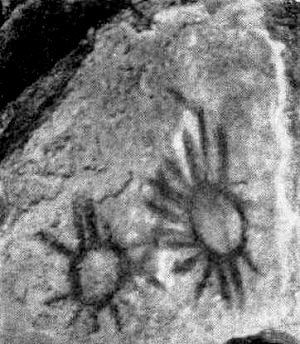 An ancient depiction, one of so many, of a two-sun sighting: this would be a mere three – to – six months prior to the last Pole-Shift. Planet X passes Earth within weeks of the storied second-Sun appearance. You have studied ZetaTalk “safe locs” to determine your best relocation site the for the Pole-Shift event and for your After-Time living arrangements. The months before the Pole-Shift. Speaking generally, the public mood will be frenetic and will become dangerously chaotic as the second Sun becomes more and more obvious. This means that great care will be needed as one moves about in traffic or walking on the streets doing their last city/town pre-Pole-Shift errands. Most likely your local food markets will be empty, but you have bought your one-to three year food supplies many months ago. The same with bottled water availability, which will be non-existent, water filters are sold out but you planned ahead. (Note: remember to buy lead-testing kits, as lead in the groundwater will be possible and unexpected. Find a new source of water if the current one has lead in it or distill. With the volume of lead dropping from the sky (volcanic dust-fall) and roiled-magma nearer to the surface, some groundwater will be overloaded with lead making water filtration unreliable. Depending on the country where you live, there may be roadblocks slowing traffic or blocked routes, but you have planned most of your moving needs ahead of time using back-roads or hiking trails by some form of transport. Cell phone towers may be overloaded or broken down, so you foresaw a need for an alternate form of communication. Thinking ahead, you guessed that you may not have an old-fashioned telephone line available (more reliable), and since you are on-the-move or the other members of your party are, you decided to invest in portable CB or HAM handheld radios. Gasoline for your vehicle will also be hard-to-get, so again you calculated your back-up supply and have stashed these containers away for emergencies. People in general will be frightened or angry and will be acting that out, so you do not expect others to behave normally or follow-through on agreements and promises. You understand the reason for that: hardened denial against the sight of a second Sun they are not prepared to deal with, nor understand. Others get that this means some kind of calamity and are now are seeking the resources of others’ for their survival. Considering human nature in difficult times, you decided to keep the details of your safe location, your food and water stores, gasoline and essential living hardware secret. You may have even buried these in separate locations for extra security. Unless you are in a land-movement zone (check ZetaTalk safe locations), it probably won’t be until the Pole-Shift that all hell breaks loose. Life beforehand may even seem somewhat normal at times but the contrast with the Pole-Shift event itself and the After-Time will be shockingly spectacular. Socially, many things depend on if or when announcements are made from your local government about Planet X and the Pole-Shift. One thing’s for sure, if there is an announcement, it will be subtle at first, then the message will be amended as the Second Sun becomes increasingly visible, unexpected and devastating Earth changes emerge or stunning Sky/Atmosphere events become glaringly public. Most likely, there will be sliding-scale updates of interrupted information with the whole story never being told. The message of the Pole-Shift is already being hinted at in a veiled way for many months now. Some examples are the so-called earthquake readiness “three-day supply of food and water”, the “Shelter in place” message and the exercising of government emergency preparedness action plans. These carefully-managed tactics, appearing to be normal public programs, are but barely audible faint whispers compared to the glaringly obvious underground bunkers built many years ago for the U.S. After-Time government. Norway has taken the lead with it’s underground seek-bank. 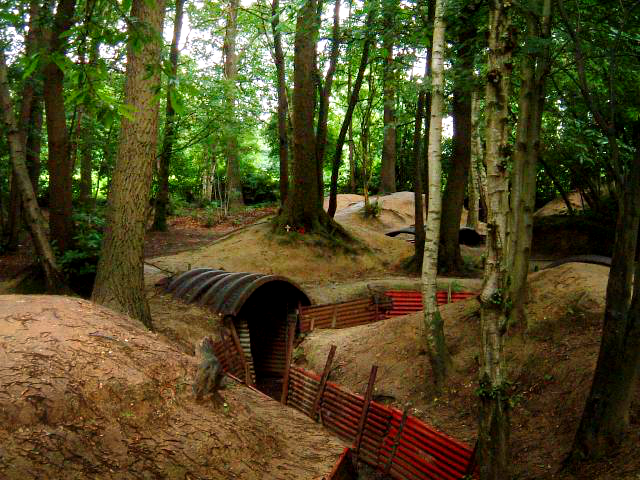 This (above image) is a First World War Trench as it appeared in 2002. (credit Ed Harding, 2009) Notice the steel roof and the length of the trench. For Pole-Shift sequestering, such a long trench design extends escape opportunity in case of tree-fall or other debris covering your trench exits, also providing runoff for water from the torrential rains of the Pole-shift. The Pole-Shift event. Since you understand the makeup of Planet X and the essential Pole-shift conditions, then you can readily envision raining rocks, extreme high winds with sheets of drenching rain and extremely loud stratospheric lightning. This also means that you understand the need to be out of the wind, below ground, covered and in a drainable location. With rocks of many sizes potentially flying with the wind, aboveground dwellings are going to sustain hits, but could likely sustain somewhat less hits if these buildings are within the lee of a berm, a steep hill or a heavily forested slope of a mountain. In any case, your plans consider any existing structure, no matter how well-placed, to be potentially found near-destroyed once the Pole-Shift is finished, unless major preparation against the flying rock and wind is implemented. In the light of all this, you have a portable building buried nearby to erect in the immediate aftertime. Riding out the Pole-Shift also could require other personal protection, such as: a helmet, knee and elbow pads and ear protection against shock waves. Possibly even a full-body suit for support that will provide protection against physical trauma such as speed skating suit. Another important item is a light and easy-to-store face mask that will filter-out odors and airborne chemicals, etc., also enabling you to work or pass through areas reeking with organic odors from rot, and of course protection from volcanic dust. Your After-Time Life: What will it be like? Envisioning your After-Time Life in a positive light is important. Being proactive now about your After-Time concepts and picking through them to see what you can find hiding there that you don’t like will help prevent just falling into default responses as the Pole-Shift approaches. For example, for some unknown reason you went with a group to settle 300 miles inland, but you found afterwards you wished you were by the sea. 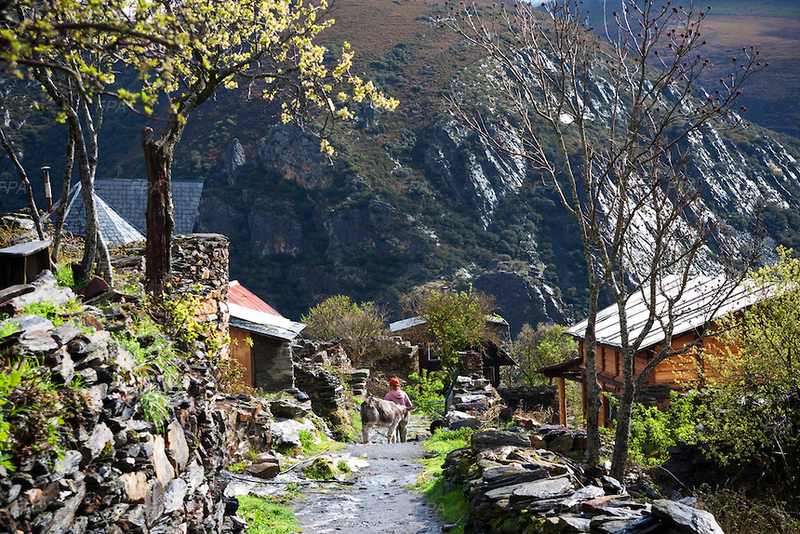 This is Matavenero, a mountain eco-village in Northern Spain. Originated by miners in the sixties, but had since abandoned the site. It was rebuilt and resettled in 1989. Exercising an After-Time happiness & desire envisioning can pre-vent these needs into your awareness. Where you settle somewhat determines what tools you buy beforehand. You may be able to trade your rifle and ammunition for fishing gear or your spinning wheel for a small boat, but it’s better if you don’t have to. What kind of people do you want in your party? What will your outreach efforts be? More importantly, what kind of Life experiences are you looking forward to and what emotions have you imbued your future After-Time life with? All the answers to these questions are revealed in our current Life and so what we feel and think now directly affects our future: the After-Time. Tough to look at some cases, but necessary if we want to make changes and improvements. We can change our future, the power to do this is nested within the choices we make. What projects and how we are engaged in them now sets the tone for our After-Time Life experiences. If you are nervous and apprehensive about the Pole-Shift and the After-Time, you only need to look at those fears to see where they are coming from. Break down your expectations of what you believe about the Pole-Shift and the After-Time and align them with reasonable and studied probabilities. For example, if you live near the coast, you know you need to seek a safe location high in the coastal mountains. By-the-way, use this interactive world map to determine your safe location from the ocean at Pole-Shift time. Being properly prepared is a good place to start shaping your after-Pole-Shift-Life and having a safe location (at least identified as a start) is essential in resting your fears with a Pole-Shift Event-Time plan being simple to arrange. Of course, once you get started preparing in earnest, you will find the details piling up, so revert to keeping it simple. Perhaps the most difficult thing for many is the blind denial of your loved ones not directly under your care, or a wife or husband resisting your Pole-shift discussions and efforts requiring a special plan of action. Sometimes you have to proceed with what you can, while other preparation plans are put on hold, but move ahead you must as you know acting on viable plans while the field is open is reassuring. 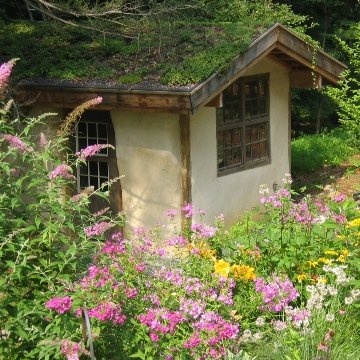 Small home constructed with cob walls and a sod roof that offers a kind of camouflage or landscape blending. One possible settlement style in the After-Time. Your settlement is patrolled by the strong and capable of your large group of settlers, although there hasn’t been an incident for many years now. The settlement is well located with the northern perimeter being up against a high ridge and the south side a long gentle slope down to a creek. Your location was established in forested hills, miles from the ocean for invisibility against marauders that used to travel by sea, but over the years only the occasional wanderer found the settlement looking for food, employment and lodgings. The founding members also chose the location for it’s several mile access to the sea coast and is near enough to a another route that other’s use (from another settlement) which is convenient for trade. The houses in your settlement were built far enough apart for privacy, but close enough to hail others for gatherings and meetings. Although the weather is still not bright enough for some garden vegetables, you wouldn’t know that by the gardens that carpet the local area and since it’s safer these days, you can see the glint of light reflection from plastic sheeting being used to assist in growing vegetables like tomatoes and peas. Chicken coops, pig and goat pens and small barns are standing here and there, and when visiting old friends travelling from one home to the other, one must follow the drainage ditches and garden paths that skirt the dark tilled soil and pastures. Who could guess that it could be so fine and peaceful like this after a few years of working hard together with a common goal? Approximately every new moon the townspeople gather for a potluck and dance, the air is full of fiddle, flute and drum for the whole evening. Throughout the evening, stories are told and important news is shared about the lives of others you know: who is ill and needs care or who has a new child. Reports of other news such as any new settlements found by those members who are returning from exploring the new landscape since the seashore moved miles inland after the Pole-Shift. The towns folk freely share food and skills within the settlement for those who are sick or elderly. Bartering goods and services as trade started soon after the settlement was founded and even a central registry was eventually developed to keep track of who owes what to whom. Yes, there are trade disagreements occasionally, so within a few years a council of fairness was organized to manage disputes and to help plan future settlement development. Those from outside the settlement who had heard about the kindness and fairness of your group, wanted to become a part of the town, yet of those petitioners with strength and good health, the requirement is that they must go through an approval process. Of course, your group doesn’t allow squatters nearby, so that difficulty was solved with frequent patrols and member outposts within a comfortable buffer zone. For those wishing to join the settlement, a trial period was decided as the best option for local inclusion before they are accepted, which is managed by the security group. Other wanderers and visitors who are ill or hungry, are treated by a special group with special settlement agreements for handling unexpected visitors. The rules? There is a nurse among your group who examines the newcomer for fitness and disease and if they are ill, then someone trained cares for them, but they are prevented from circulating within the settlement until healthy again. Once healthy and able to move on, a choice is made to stay to go, but they pass through the approval meetings and set-rules. In the case of death, both burial and cremation is used according to settlement agreement. Non-threatening visitors are treated kindly but always with an eye to the rules of mixing with the settlement: no unexpected extended stays. This is a small settlement with a few hundred people, not a large free-wheeling coastal boom-town, the big settlements have different and perhaps more harsh rules! This is just one set of thoughts for a settlement, there are so many other variants depending on the constituents and the location. Small groups are more vulnerable but flexible with larger groups having a broader skill-set pool but are complex. One thing is sure with all types of camps, there will be transitions and many changes such as members leaving and those wanting to join, so because of the “new blood” and the variety of changes, it is very important to have managed and agreed upon settlement rules with an understanding that the rules will be updated and modified on-the-fly by elected settlement leaders. This means regular meetings, cooperation and quick and strong enactment of those rules, this is if members want that kind of security. Other kinds of societies will be more free-flowing and creative, probably a coastal settlement that is more spread-out will have more members who are more independent and reliable. Also, if inter-settlement trade is conducted within town limits, that is another model entirely or perhaps the little town is a way station between routes to other camps or coastal villages, that is different again. Personally I so look forward to assisting other groups, exploring the new landscape and helping any way I can to establish new towns and villages for the new world to come in the After-Time. In the After-Time, frontier justice will replace the buffer of current civil laws, police and the courts since old-style pre Pole-Shift governments will quickly become a thing of the past. Direct consequences will be meted-out to thieves and those involved in violence by the community: ostracization and possibly even death in very rare cases, but with agreed-upon rules. Those who are troublesome to live with, but healthy and able to walk are likely to be ostracized, in time. Every settlement have to develop citizenship rules, including very harsh punishment: you cannot have thievery or other crimes go unpunished, especially when every cabbage head, pound of deer or fish meat, bunch of greens or bag of mushrooms is hard to come by, or a main family supporter is lost due to an altercation. Often, a person ousted from a frontier town either changes their ways eventually, or will find death sooner than later, this is why it is the preferred method of punishment. The After-Time environment will not be tolerant to the criminal and conversely, can offer a rewarding Life to the loving, hard-working and cooperative. Built in 2003, this cob house is situated in West Wales. The owner has since left and has built another cob home in an “eco village” donating this one to the locals. Can you see yourself living in a house like this? See your ideal Life, reach out and touch it with your imagined fingers, find it waiting in your bones because it’s there. Mold it as you will and make it a mashable markup of what you truly want. We all need a place to live freely and to express ourselves and it is up to each of us to decide which environment we wish to live in. Better to be imagined beforehand than waiting for circumstances that may never come or to victimize ourselves by allowing others to make our decisions for us. Some Pole-Shift details are derived from ZetaTalk.com.